page from one of my books. 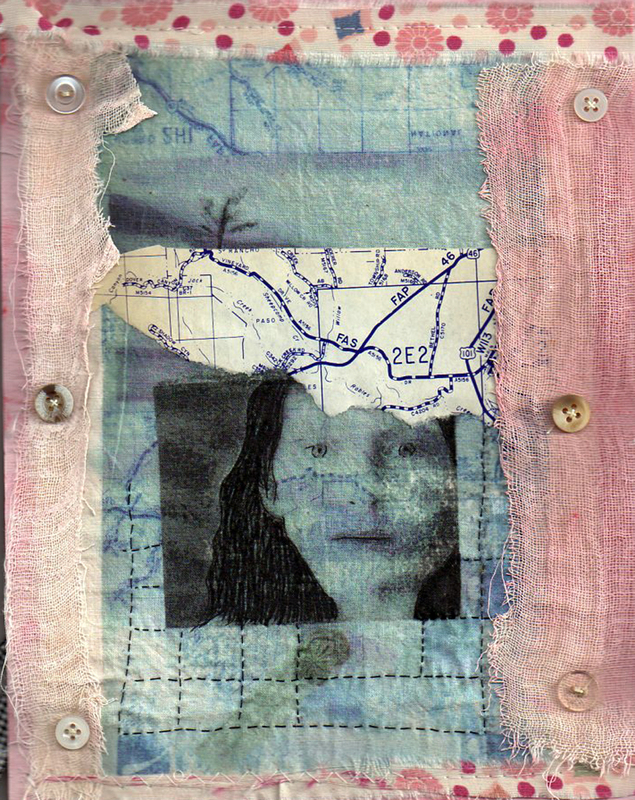 photo transfer on muslin, cheesecloth, map, paint and buttons. no dragonsblood red was used. from what book? what kind of incredible books do you have????? Photo-transfer on muslin! Did you use the acetone technique? My artist-employer is experimenting with photo-transfer on glass, but I've only done it on paper. Do tell! Lovely! Did you make an all fabric book? I love the photo on the fabric. I want to try that some time. Your photos are so interesting. written sometime in the 1800 as a guide for aspiring artists. an absolute treasure i found at the Getty museum. it wasn't an acetone transfer, i could never make those work. this one was done by printing the image on to a transparency, coating the muslin with matte medium laying the printed image down and using a brayer to transfer. no muss no fuss. i'd love to try one on glass! this particular book is mostly fabric with some paper thrown,sewn or glued in. i have made some all fabric where i used either matte medium or interfacing to stiffen. works like a charm. i did my cook book that way. i think there is a photo in here somewhere of it. i recommend the transparency method as it is easy and works almost every time.